Nineteen men, all Shias, were handed jail sentences ranging from life in prison, to 15 and 10 years after a court found them guilty of spying for Iran and Hezbollah and for plotting to overthrow the ruling family. Eight of the defendants received life imprisonment, nine were handed 15 years while the remaining two got 10-year terms. 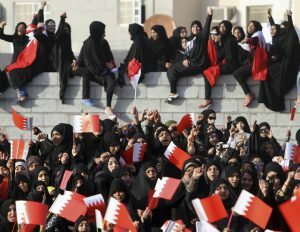 Fifteen of the convicted have been stripped off their Bahraini citizenship according to a judicial source who asked not be named. The men, alleged members of a group called Al-Wafaa Islamic movement, are said to be close to Iran’s powerful Revolutionary Guards and Iran-linked but Lebanon-based group Hezbollah. The court in one case found them guilty of leaking information to the elite of Revolutionary Guards and the Hezbollah. The court also said they received material support from the Shia group and Tehran. They are also accused of inciting public discontent against the government and calling for regime change by force, reports say. The small monarchy has been accused of violation of human rights. Authorities have likened public demonstration to terrorism. Several activists and Bahrainis have been jailed and stripped off of their citizenship since 2011, the beginning of public demonstrations calling for greater rights and for an elected government. Authorities have repeatedly accused Iran of fomenting rebellion to overthrow the Sunnite regime. Written by: KanelkaTagba on October 31, 2017. Posted by KanelkaTagba on Oct 31 2017. Filed under Gulf News, Headlines. You can follow any responses to this entry through the RSS 2.0. Both comments and pings are currently closed.